Cahors (pronounced kaˈurs) is less than an hours drive from Toulouse, the 4th largest city in France. It is in the Department of Lot within the Midi-Pyrénées region, with a population of about 30,000. 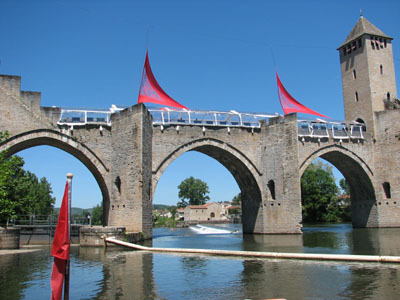 This is a medieval city surrounded by the Lot River whose number one attraction is the Valentre Bridge. The bridge building (UNESCO listed) began in 1308 and was completed in 1378. It has three towers and was used for medieval defense of the city. In that century, Cahors was a center of finance for Europe. French leader Leon Gambetta (1838-1882) was born here (his statue sits in Place Mitterrand), as was Pope John XXII. - Musée Henri Martin featuring works by the painter and an exhibit of the city’s most famous son, Leon Gambetta. - Shop at the various truffle markets for the “black diamonds”. - See the many “moulins” or windmills. 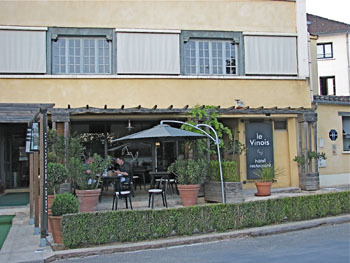 - Chanterie is a local museum devoted to wine. - Saint-Étienne Cathedral (UNESCO listed) is the home to a museum of religious art and is a fine example of gothic architecture. Try to get to one of the painted caves featuring paintings and engravings dating back more than 20,000 years. There is a limit of 700 visitors a day, so book in advance. And of course, there’s the wine. Cahors is an Appellation d’Origine Controlleé (AOC), which is part of the Southwest France wine region. The AOC Cahors can only be used for red wines. There must be a minimum of 70% Malbec in any wine called Cahors with the 30% balance Merlot and/or Tannat. The grape is known locally as Cot, Cot Noir or Auxerrois. The name Malbec can appear on the label if at least 85% of the blend is Malbec. Malbec only fully ripens at the beginning of October. Hence the weather in September is especially important to a successfully produced Cahors. This is the only AOC in Southwest France to prohibit the use of Cabernet Franc and Cabernet Sauvignon. The wines can be quite tannic when young and definitely benefit from aging. There are many producers making a new style Cahors wine that is ready to drink when bottled. 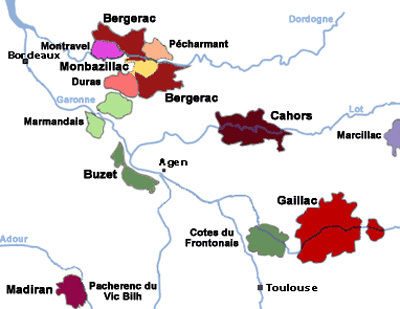 Although many growers produce white and rose wines, they cannot have the Cahors appellation, which is solely for red wines. 11% of the total acreage of Malbec worldwide comes from Cahors (19.5% if you include all of France), a total of 1.8 million cases. Argentina has over 71% of the Malbec plantings. It was brought to Argentina in the mid 19th Century by a French agronomist as a government program to improve all aspects of Argentine Agriculture. Typical aromas characterize the terroirs of Cahors: violet, menthol, truffle, black currant, cherry, licorice and vanilla. 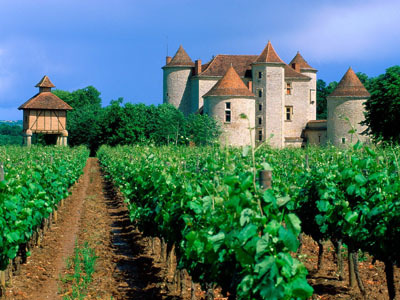 There are Tender & Fruity Cahors wines that are 70-85% Malbec. They pair well with white meat, roast poultry or grilled meat. Their light tannins go with a mixed salad or fish casserole and most Provençal dishes. The Feisty & Powerful Cahors wines are 85-100% Malbec. These wines boast complex fruit. Duck breasts and Quercy lamb are their perfect partners. Try with crepes, walnuts and chestnuts. With age, once their tannins have softened they go well with cheese. Finally, there are the Intense & Complex Cahors wines which are 100% Malbec. The passing of the years makes them the perfect partner for lamb, foie gras, truffles and wild mushrooms. Rabbit with prunes, deer with cranberries and pear cooked in wine call for the “Black Wine of Cahors”. 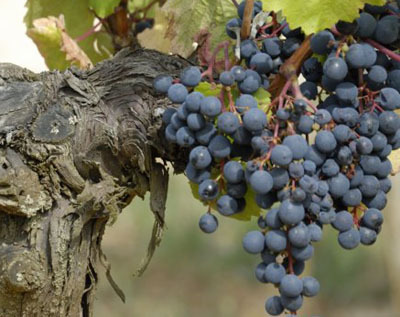 The first vines were planted around 50BC and during the Middle Ages the wine was known as “the black wine” (Vin noir). Tsar Peter the Great of Russia chose Cahors to be the Mass wine of the Russian Orthodox Church. Phylloxera destroyed the vineyards at the end of the 19th century. In February 1956, Cahors had severe frost, which once again destroyed almost all the vineyards. They were soon replanted and Cahors was awarded their AOC status in 1971. The vineyards are an equal distance from the Atlantic Ocean, the Mediterranean Sea and the Pyrenees Mountains. They are about 35 miles in length and 18 miles in width. During the second half of the 19th century Argentina adopted the Malbec of Cahors in the Mendoza region, at the foot of the Andes. Argentine Malbec has been rising in popularity over the past few years, as it provides the grape with a suitable climate for it’s ripening. Almost all of Argentina’s wine growing regions can support the growth of the Malbec grape as they are at high altitudes and sheltered from the rainfall from the Andes, providing the grape with around 320 days of sunshine a year. La Table de Haute-Serre (Cieurac)- A unique stone cellar restaurant with inventive cuisine that combines terroir and modernity, associating local products that follow the seasons. Located at the winery Château de Haute-Serre. 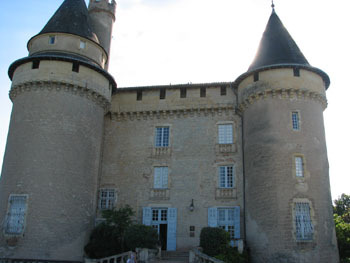 Same owners (Georges Vigouroux) as Château de Mercuès. Le Marché- Refined and creative cuisine in a cozy atmosphere. Le Bateau au Fil des Douceurs- A large barge restaurant with traditional Southwest French cuisine. La Garenne- Savory traditional cuisine in a restored barn. 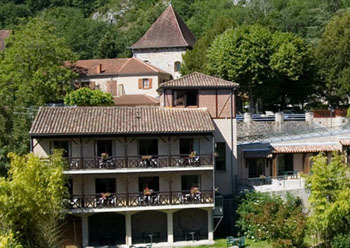 A 4 Star Relais & Chateaux property in a 13th Century castle with 24 rooms and 6 suites, overlooking the town & vineyards. Their 1-Star Michelin restaurant has a large underground wine cellar. 10 minutes from Cahors. Refined and creative cuisine in a contemporary setting. 3 Star Hotel has 10 rooms. A 3 Star hotel built in 1900, in the center of Cahors, by the railroad station. 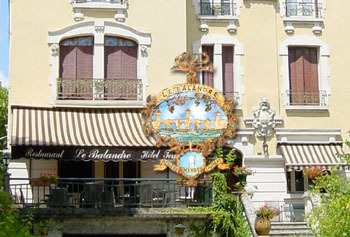 Le Balandre restaurant has a 6-course Carte Blanche dinner and offers cooking classes. 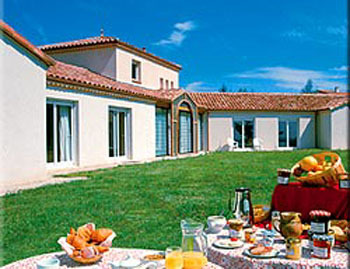 Located 5 minutes from Cahors is a charming 3 Star hotel with beautiful gardens. 15 minutes from Cahors in an old coach inn, run by the same family for 5 generations.